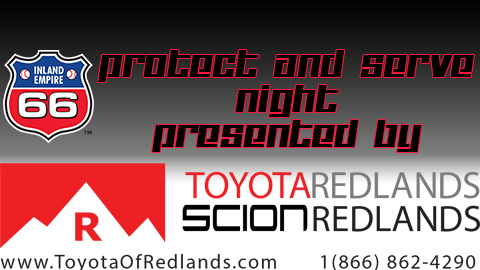 San Bernardino, CA - The Inland Empire 66ers have partnered with the San Bernardino County Sheriff-Coroner's Department and local police departments for a special Protect and Serve Night, presented by Toyota and Scion of Redlands, honoring the brave men and women of local law enforcement. Proceeds from ticket sales for the game and bids from the silent auction of team jerseys will benefit the MacKay and Collins families, both affected during the recent Big Bear manhunt. "The Inland Empire's law enforcement was tested recently, and they showed the nation their strength and resolve under pressure," said Inland Empire 66ers General Manger Joe Hudson. "We look forward to honoring our brave local men and women who protect us every day, and especially the two families who were most deeply affected during the recent tragedy." "The Protect and Serve Night is a wonderful event that brings together the community and law enforcement," said San Bernardino County Sheriff-Coroner John McMahon. "We will be honoring two of our very own heroes, Detective Jeremiah MacKay and Deputy Collins. A generous amount of the proceeds will benefit both families as they embark on new challenges and the process of healing." Twenty percent of all ticket revenue will be donated to the families of fallen officer Detective Jeremiah MacKay as well as his seriously wounded partner, Deputy Alex Collins. In addition, sheriff's-inspired jerseys worn by the team and coaches for the night will be auctioned after the game to benefit the families as well. "Toyota of Redlands and the Tom Bell Auto Group are honored to host this special event to benefit the families of fallen Detective MacKay as well as injured Detective Collins, and all law enforcement," said Paul Smith, General Manager of Toyota and Scion of Redlands. "These individuals put their lives in jeopardy every day to protect and serve the people, property and businesses in our areas. We are glad to have a part in this event to help relieve the families of financial burdens, faced when tragic events occur out of their control." Tickets should be in high demand since Saturday, July 20, is also Mark Trumbo bobblehead night, presented by the San Manuel Band of Mission Indians. Inland Empire fans can purchase group packages for this or any other Inland Empire 66ers home game. To purchase tickets or for more information about the Inland Empire 66ers, please contact Adam Franey at (909) 495-7633. Additional information is available online at www.66ers.com.